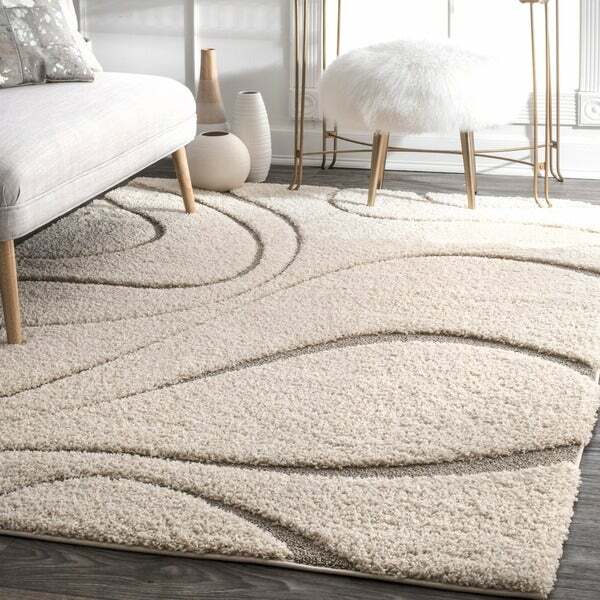 Enhance your home with contemporary elegance with this luxurious shag rug. Featuring a soft shag pile, this plush rug is comfortable under-foot. The pale ivory color and carved, abstract pattern complement any space with modern simplicity. Actual rug is a bit closer to ivory & beige than white & gray. Also it's plusher than I expected. The swirls are sculpted in, in a lower pile, giving the rug plenty of dimensionality. Overall I'm very pleased. Really like this one. very pleased with the quality of this shag rug. This is a lovely rug that I am using in my guest bedroom. Love the color, and the shag is plush, but still easy to vacuum. Highly recommend this rug. First of all arrived on time and in great shape (a big plastic wrapped roll). 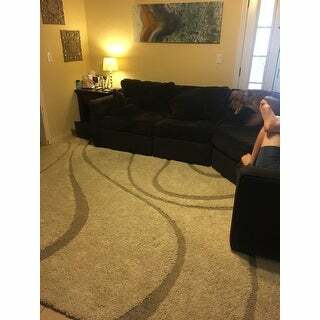 Rug is as appears in picture online. I have ended up purchasing two of this style of rug, since I have a livingroom/diningroom "L". 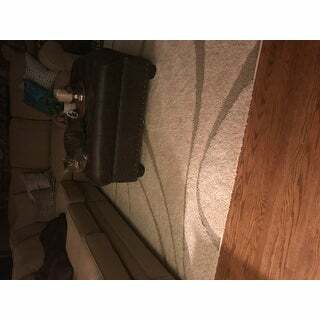 I purchased two rugs for both areas, to cover hardwood floors, to go under coffee table and under dining table. 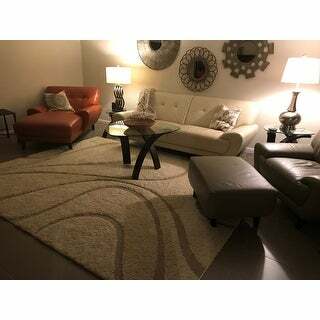 Color of rug is not exactly white-white, but just a sort of creamy white with a very light grey/taupe swirls through it. The grey/taupe swirls are actually a little lower in height than the white shag and strands are looped, as opposed to white shag which is cut loops, which gives a more definite design in the rug. Nice feel under feet, not a heavy shag rug but shag still dense enough and still looks good with my light pearl gray/white sofa and gray metal/glass coffee table, the "Alice Wood/glass/metal coffee table" also purchased from Overstock. Delivered on time, arrived in good shape, was easy to straighten out from being rolled (takes a couple of days), put a pad underneath since covering hardwood floors and works well. I cut the pad about 2 inches shorter than the dimensions of rugs so that the edges would lay down flat enough to avoid tripping. Great purchase, very upscale and modern look for my new off-white sofa and chair. Very pleased. Does not look cheap at all. I bought this rug for my sunroom and love it! The color is a nice neutral color and the texture is a very nice soft shag. I would highly recommend this rug! I was hesitant to purchase another rug online because they all had fallen short on my expectations. It’s difficult even after reading dozens of reviews, because there is always people who really disliked the product and leave negative reviews. Everyone has different decor taste and opinions of what looks and feels good for themself. So I read almost every review and pondered purchasing this rug for at least a month. Looking for the best price and free shipping. So I loved the way this rug looked in so many of the reviewers photos that I had to buy it. I have to say I was nervous about it being so light in color as I had a big dog, cat, and 2 kids who are all messy. Once it arrived and I unfolded it it really felt soft and plush. More more than expected even. Laid the rug out flat for a couple day in an unused room. Still had some lumps from being rolled but no big deal. Figured it needed furniture and people to flatten to perfection. And it did just that. I have old school large square tiled floor and so it’s hard and cold. When I walk through my house stepping on all the different textures of our current flooring, then I step on this rug and I smile almost every time. It is perfect length shag, nice and soft with good density. The color is awesome, it has brightened up our living room. This rug beautifully complements my living room. The shag ivory and inset taupe design are true to color. The shag is very plush and soft to walk on. I ordered the 8 x 10 for my living room tile floor and it is perfect. I've received many compliments on this rug. 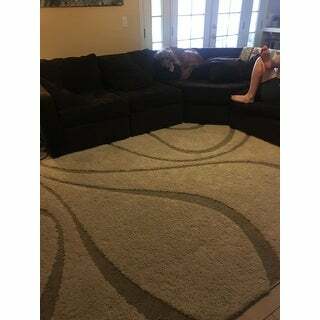 I needed a large rug for under my dining table and this was a great size for this price point. The rug is most definitely ivory/cream and a longer pile. The swirl is a khaki/tan color, but I would say it leans slightly to the cooler/more grey shade of khaki than the warmer/more brown shade of khaki. The pile on the swirl is quite a bit lower than the main ivory area. The edges are bound and it would need an anti-slip pad if you were using it out and open. My dining table is heavy and large and keeps it anchored. If I had realized how long the ivory pile is I would not have purchased it for under the dining table since food will be harder to clean out, but I like it enough to keep it. 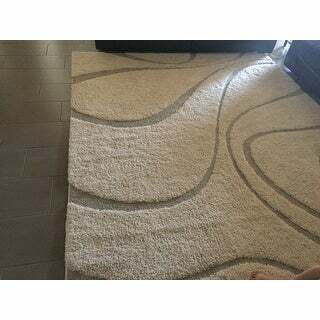 Option: Cream - 5'3" x 7'6"
Excellent rug, nice, plush and stylish. I just had my carpets ripped out and bamboo hardwood floors installed and needed throw rugs. This rug is sharp looking, comfortable, and durable. I am very happy with this purchase and Overstock. The plush shag is cream colored and the design is a shorter and darker carved shag, adding great contrast to the rug. Good luck for the price. Contemporary look which brightens up my room. Color is off though...i thought I was buying a grey and ivory rug and it is very much beige. Its nice, but I was disappointed as I was looking for a cool gray. Thi rug is very nice. It lightens up my living room and is a perfect neutral. What I like best about Overstock is its excellent shipping. I ordered this late on a Sunday afternoon and it ws at my door on TUESDAY MORNING. I have never had a problem with Overstock. 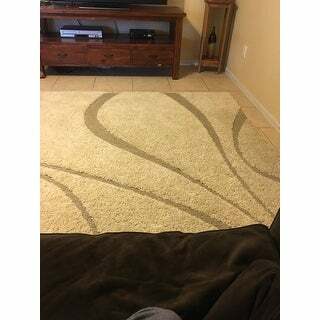 Very nice and soft, this rug really complements our living room. The rug is not wool, which is good for someone with the allergies. The chemical smell took a few days to air out. Overall, great value for the price. I love my rug! Just as pictured and is soft and plush underfoot!! I absolutely love this rug! It was exactly what I was expecting. We've had if for about a month and it's relaxed nicely and lays flat. I would highly recommend. This is a great rug for trafficie area of the house! Very modern looking and the color is very neutral but it still makes a statement! Highly recommended! I have always loved my Overstock items but this one is a hguge disappointment. I HATE IT!!!! It is NOT ivory!!!! It is TAN or khaki at the least! SO much yellow in it! I cannot wait to sell it! The quality is fine but the color is SO off that I am furious!!! I love the neutral color and modern flair it gives to my family room! Love how it looks in our den. Great rug! We have darker brown carpet and this brightens up the floor in our living room, as we decorate with mostly earth tones. Hasn't shed or come apart anywhere in the past few months and is very easy to maintain! I definitely recommend this rug to anyone looking to spice up just about any room in the house. The pattern really sets it off and it easily matches just about anything you already have. Light or dark and most any color. I love it. These rugs have really surprised me they have really held up great. We had over 30 family members over for Christmas and about the same number for New Years. They still look great and would buy them again. I absolutely love this rug. It is exactly what I expected and gives me the look I was seeking. The delivery was exceptional; the shipping stated I would receive it May 2nd; however, I received it April 18. I ordered another item that was due to be shipped April 18 and both were received at the same time, which was great because both pieces were needed for the same space. I am completely satisfied with this purchase and would recommend it. Perfect color to match our formal living room. The waves match perfectly our sectional couch. I couldn’t have asked for a better rug to tie our living room as good as this one does. Love this carpet. We have a large open floor plan and already had an Oriental carpet. This matches perfectly. We have several cats that like to scratch our carpets but the shag hides it perfectly. Looks very plush for the cost. I would recommend this to anyone. "I just received this rug and ran my fingers through the pile to lift it. I had a waxy like coating on my fingers when I did. Is this normal and what is it?" When I received my rug, I did not notice a waxy feel to the shag which I got about a year ago. Perhaps this is a protective stainproofing chemical they have since added? You may want to ask the manufacturer. "Does this rug come in 10×10, or larger?" "My only concern is the high low of this pattern looks severe. Can you feel that difference when you walk on the carpet? I see a overstock person has said the .30 was incorrect the highest part is one once thick. Another question is what is the difference between the high low pattern? If highest shag is 1 inch was the lower part? In the picture the lower part appears to have very little if any shag more like a close looped yarn. 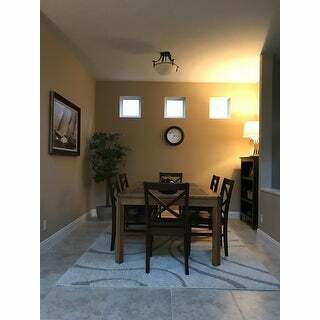 I’m thinking of putting in my formal living room which is adjacent to my dining room which has a carpet that’s a deep brown background with other shades of browns and reds in it, walks in there are deep red and brown. Walls are a light brown in the living room. Ill appreciate all responses. Thanks! " The dimensions sound about right,the rug is closer to a taupe and ivory color very neutral. You can feel the posh shag on bare feet. Place something heavy around the corners for a few days to lay flat. I don't have much traffic on this rug at all so easy to maintain so far. I purchased in October 2018.. The thickest pile height of this item: 1.18 inch. The waves thickness can vary from 0.30 to 0.50 inch . You can feel the difference of thickness but gives this abstract casual style to your formal living room. The high shag is about an inch. The low darker color is maybe 3/8 inch loop. I love the feel underfoot, you don't really distinguish the differences when walking on it but it all soft and wonderful. The darker color will go with anything as will the ivory color. "Is this available in any other colors?" "How long does it take to get rid of the heavy chemical odor." My rug actually did not have a noticeable ordor. I guess im extra sensitive because it had an odor, chemical smell to it. I left it outside to have fresh air go through it. "Is the pile height. 30 or 1 inch?" It's 0.5 inch. I hope it helps.